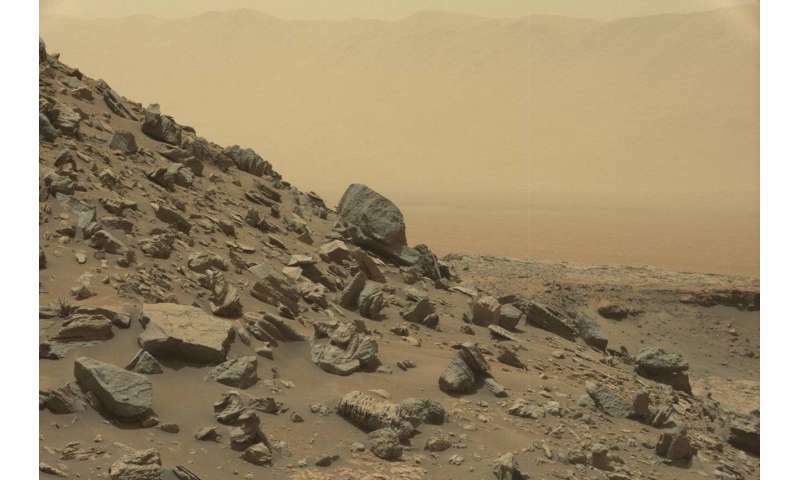 The search for life on Mars has taken a step forward with the NASA Curiosity rover's discovery of organic matter on the bottom of what was once a lake. It may once have been part of an alien life form or it might have a non-biological origin – either way this carbon would have provided a food source for any organic living thing in the vicinity. The discovery adds extra intrigue to NASA's search for extra-terrestrial life forms themselves. When hunting remotely with one car-sized machine, the question is where best to focus your efforts. It makes sense to look for the same types of places we expect to find fossilised microorganisms on Earth. This is complicated by the fact that these fossils are measured in microns – mere millionths of a metre. The Curiosity rover looks for certain sedimentary rocks deposited near water, as it did for the latest discovery. This is based on the latest geological advice about the best prospects. Yet which rocks to prioritise is still a matter of some debate – and it's a question that is just as relevant to geologists trying to unlock the secrets of our own ancient world. The Earth's rocks and fossils are the nearest thing we have to time machines. For a century or so, geologists focused on a type of rock called a stromatolite – devoting long hours to crawling around in awkward spaces trying to find them. 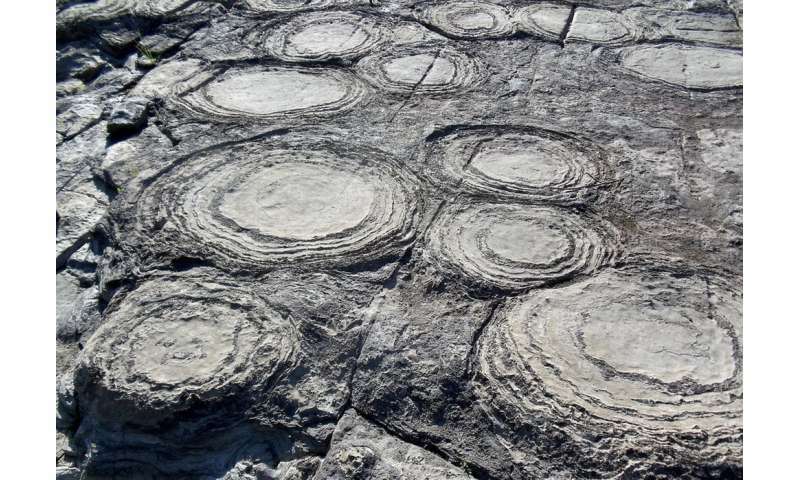 Stromatolites occur mainly in shallow water and are layered on a millimetre scale. Many of them are undoubtedly built by slimy microbial "biofilms", but to cut a long story short we now appreciate there is more than one way to make a stripy rock – and they don't all involve microbes. More recently geologists have become more interested in other types of rocks, including the "black smoker" tube-type deposits formed by hot hydrothermal water being squeezed out of the Earth's crust in the deep sea. Slightly easier to examine are similar chimney-like formations found in certain alkaline lakes around the world. One place on Earth where these chimneys occur is Mono Lake in California, a vast and beautiful stretch of water several hundred miles north of Los Angeles on the eastern slope of the Sierra Nevada mountains. In October 2014, our team obtained permission from the California State Parks to examine and sample some of the calcium carbonate chimneys that have formed there. The rocks, which are frequently between two and three metres tall, are very young in geological terms, usually only tens of thousands of years old. But since first being described by the famous American geologist Israel Russell in 1889 they have proven an excellent natural laboratory for groups of scientists trying to understand how these structures came about. Before our visit, geologists were essentially divided about these chimneys. A group we might call "pure geochemists" proposed they were nothing to do with microbes, but produced by calcium-rich spring waters coming into contact with the alkaline lake, with its abundance of carbonate ions. A smaller opposing camp agreed it should be possible for these structures to emerge in the way that pure geochemists were suggesting. But they pointed out that, in the few recorded observations of carbonate rocks forming at the lake in the 19th and 20th centuries, some kind of biofilm did appear to have an influence. 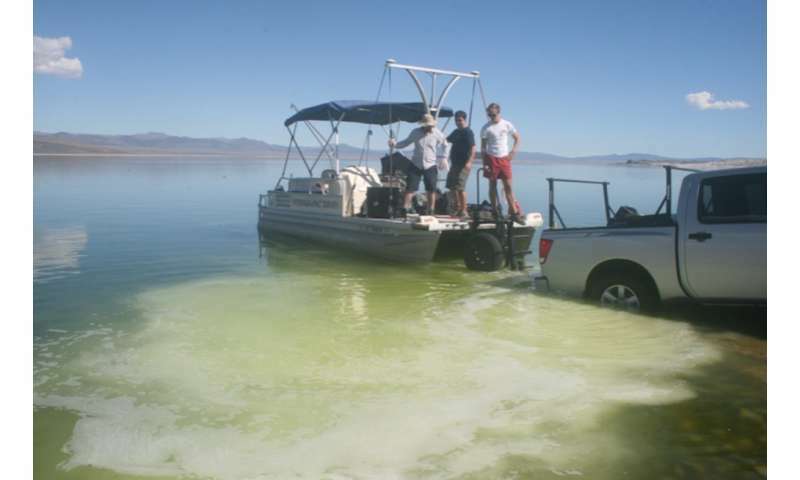 They also cited other studies that had shown that waterborne microbes called cyanobacteria did produce slimy substances that can accumulate calcium. We went to Mono Lake to find out who was right. Our six-strong expedition divided into two factions: one looked for chimneys on the lake bottom using a research boat, while the other explored the famous "tufa towers" that rise up from the lake shore. The boat party toiled and cursed the astonishingly salty waters of the lake, while the shore party made steady progress with the invaluable assistance of local state park ranger, Dave Marquart. Their peace was interrupted only by a phone call from the stranded boaters requesting they urgently try to find someone with a four-wheel drive capable of pulling the boat back out of the water – luckily help was at hand. One of the sites the shore party visited was in Marquart's own back garden to the north-west of the lake. The rocks there were part of a set of ancient chimneys formed along a small tectonic fault. Their features suggested they had been built by microbes, but we needed to send them to a lab to be sure. Using an optical microscope, we were able to see dark thread-like structures entombed in slices of the rock. 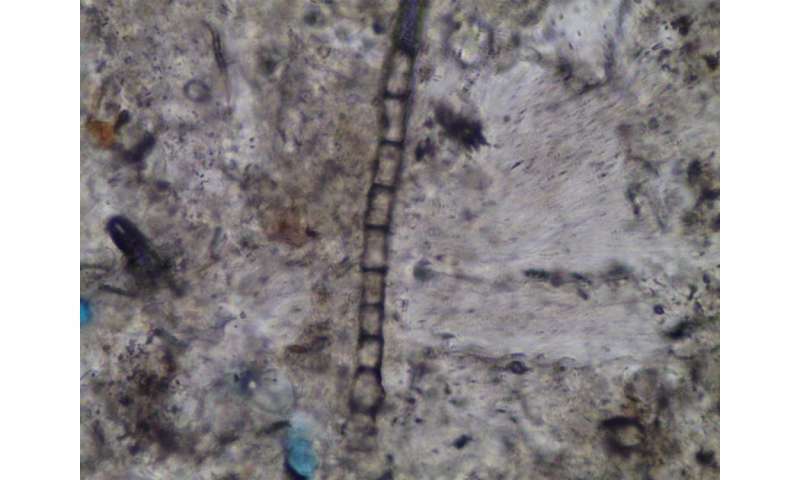 As we outline in our new study published in Geobiology, these "threads" are millions of fossilised photosynthesising cyanobacteria that once surrounded waters rising from a spring on the lake floor. We sent the samples to Australia for further testing to establish whether the microbes played a key role in building the chimneys. This revealed surrounding patches of carbon and nitrogen, which we took to be fossilised cyanobacterial slime. This slime traps calcium and when it breaks down it creates calcium carbonate, entombing any living and dead cells in rock. We found other ways in which this microbial slime had affected the fabric of the rock: grains of quartz and aluminosilicates that were clearly sand that had got stuck there, too. 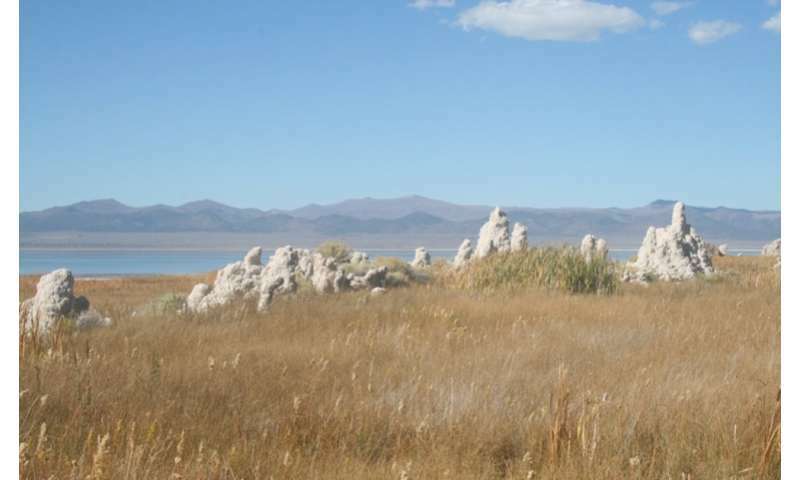 In short, we found evidence that cyanobacteria formed tubular mats around rising spring water in the ancient Mono Lake – probably producing the majority of the resulting chimneys there, though there may be examples of "pure geochemistry" chimneys as well. This suggests that these rock formations do indeed represent a promising and fairly large target for exploring ancient or extra-terrestrial life. They have the added advantage that the calcite rocks in question are geologically quite stable. This means the fossils could potentially be preserved for a very long time – easily hundreds of millions, quite plausibly billions of years. To our knowledge no chimneys have been found on Mars yet, but they are not common on Earth and there is every chance that they have a Martian equivalent. There, and on other planets and moons, we should be looking for areas with conditions as similar as possible to where these chimneys exist on Earth – volcanic rocks where spring waters might once have risen through the bedrock into an alkaline lake. Without any question, NASA's hunt for suitable rocks on the red planet should make finding them a high priority.